Where is the login and password for HTML5 channels? Please note that this is always a series of six numbers, for both the login and password. 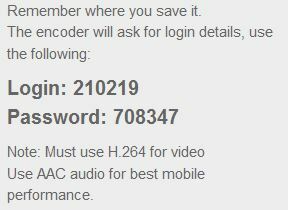 Some encoders like Adobe Flash Media Live Encoder will prompt you every time for the login details, while others like Wirecast require going once into BROADCAST SETTINGS and then SET CREDENTIALS inside the encoder.